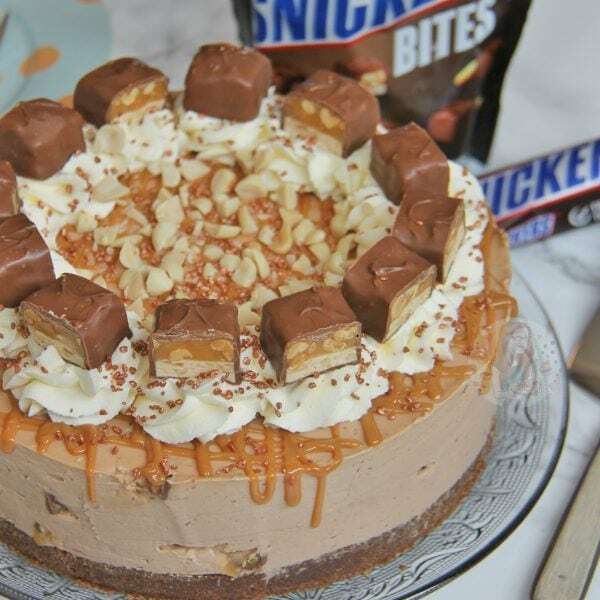 Chocolate Peanut Biscuit Base, Chocolate Caramel Cheesecake filling full of Snickers, with Whipped Cream, a Caramel Drizzle, and even more goodness. 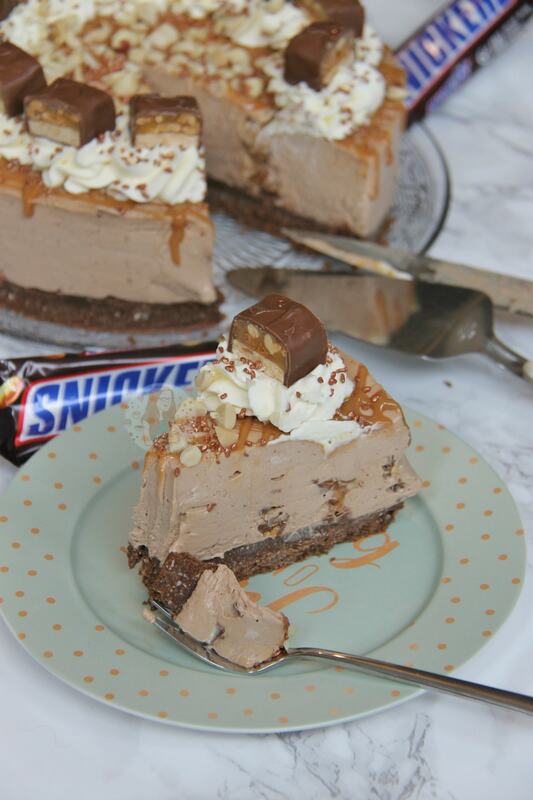 An amazing Snickers Cheesecake! So, this recipe has been requested SO MANY TIMES I can’t actually keep up. I didn’t do it for ages as I couldn’t eat peanuts for a while, but now… now its happened. It is dreamy. I knew I wanted my Cheesecake to be a No-Bake like a majority of my other cheesecake recipes, as I love them so much. They’re creamy, delicious, and only take about 20 minutes to make them! 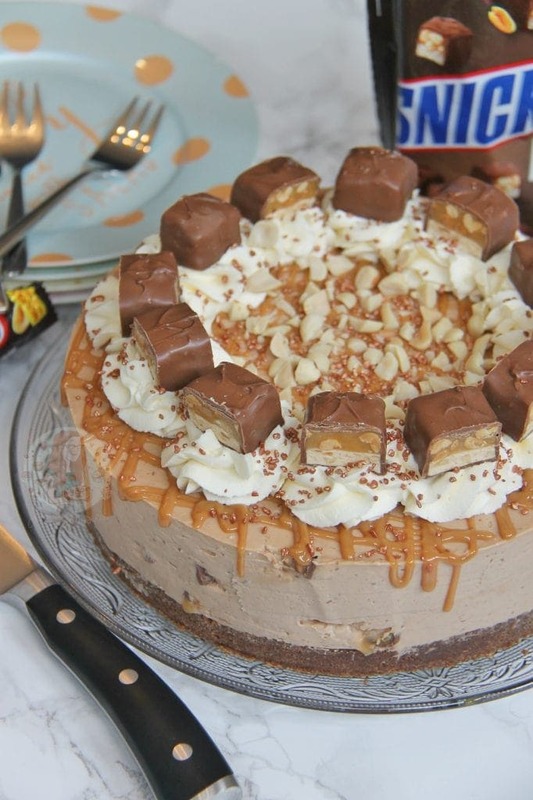 I based a majority of this recipe on my No-Bake Mars Bar Cheesecake as Mars Bars and Snickers are very similar, just Snickers have the Peanut addition. The No-Bake Mars Bar Cheesecake calls for a plain Digestive base, so I changed it up slightly to use a cocoa chocolate base like my No-Bake After Eight Cheesecake. However, I wanted to make it to be slightly different, so I used some Peanuts in the base as well. I made sure not to use too many Peanuts as I didn’t want it to be a complete and utter overload, but enough to give it a delicious peanutty flavour. I decided that I wanted mine to be more caramel flavoured than peanut flavoured as I just prefer it that way. If you wanted to make it more peanut like however, you could substitute the Caramel in the cheesecake mixture for 100g of peanut butter. Or, you could drizzle peanut butter on the top by melting some carefully in the microwave so its loose enough to drizzle and use that instead. Honestly, its so adaptable. 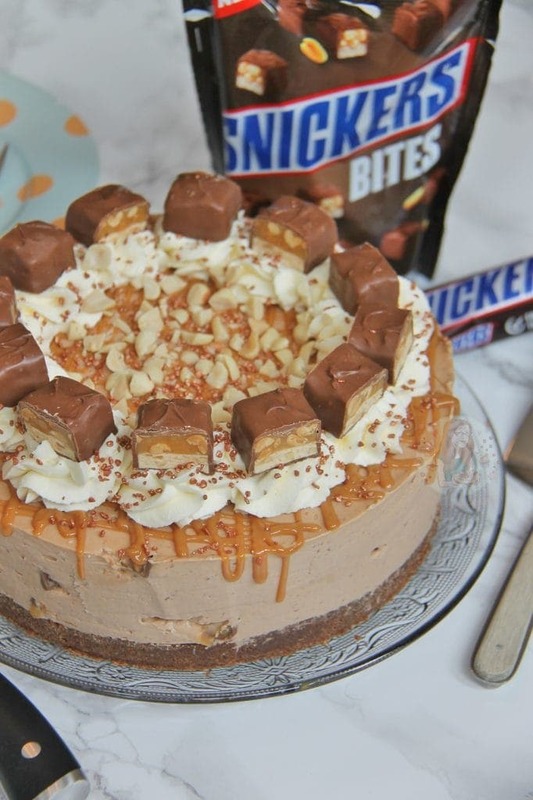 As this is my first Snickers recipe on my blog, I can’t refer you to any other I have done… buy you could easily adapt others to use Snickers if you’re a fan. 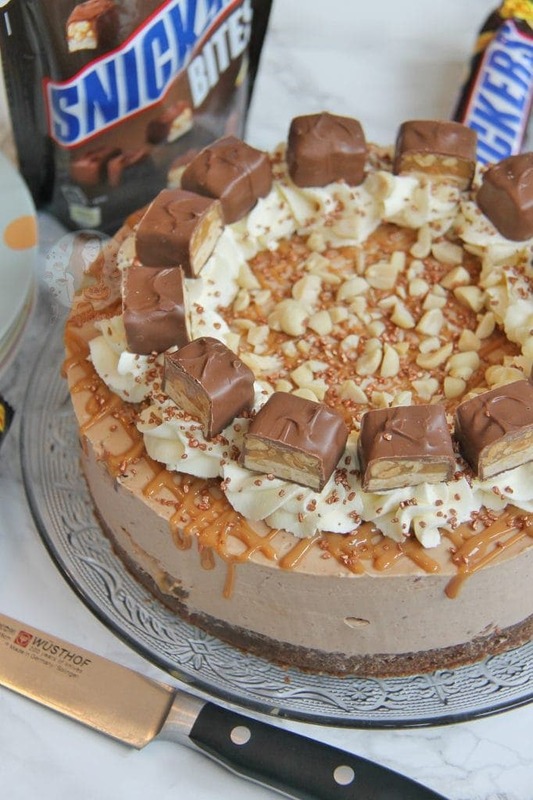 For example, you could use Snickers in my Peanut Butter Pie, or even in my Peanut Butter Fudge. Melt the butter in the microwave on short bursts on in a small pan over a medium heat. Blitz the biscuits, cocoa powder, and peanuts in a food processor to a small crumb, add the melted butter, and pulse a few times until it is combined well. Melt the chocolate in a bowl over a pan of gently simmering water, stirring gently or microwave in short bursts until fully melted – leave to cool slightly whilst doing the rest. With an electric mixer (I used my KitchenAid) Whisk the Cream Cheese and Icing sugar, Carnations Caramel, and Vanilla until smooth – Whilst mixing, pour in the melted chocolate and whip again until smooth. Pour in the liquid double cream and continue to whip the mixture until it is starting to thicken a lot like a Mousse does (I use speed 6/10 on my KitchenAid) It won’t take too long as the chocolate will harden quickly and cause it to thicken. Fold through the chopped Snickers bits through the mixture – Pour the mix on to the biscuit base, smooth over, cover, and chill in the fridge for at least 5-6 hours hours or preferably overnight. Remove the cheesecake from the tin carefully. I whip together my double cream and icing sugar till thick and pipeable. Drizzle over the caramel, and pipe the whipped cream on using a 2D Closed Star Piping Tip. 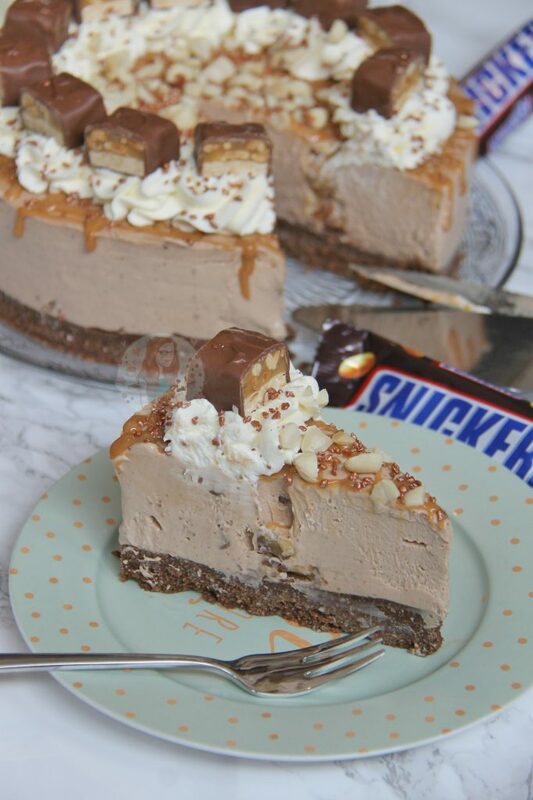 Sprinkle on some chopped peanuts, and add a piece of Snickers to each Cream swirl! If you don’t want to use Caramel, you can easily swap it to Peanut Butter as well. Swap the same amount for Peanut butter, and drizzle some melted peanut butter over the top as well! If you don’t want to use either, use 300g of milk chocolate. You can use Dulce De Leche, or other caramel for example, but you want a thick caramel sauce. Older Next post: Lemon Meringue Roulade! Yes you can do, but I do always say if you can keep it fresh its better – freezing and thawing is fine but can sometimes change the texture. I just run a knife around underneath, and slide if off, but I’ve made so many 100s of cheesecakes I am quite skilled at it now haha! You can line it to make it easier, but I tend to find that a little awkward! I’ve never personally tried it, but I don’t see why not! 1. I just bought an 8″ Springform – so, do i just use it without any parchment paper? 2. I will be using Philadelphia cream cheese – as i know they contains some liquid in the tub, do i use muslin cloth to squeeze all the liquid out? I usually just let the excess liquid drip out of the tub, but I don’t squeeze it out. And yes I don’t line the base, I just use it as is! I can’t get carnations caramel, is there something else I ca use instead? I got carnations condensed milk and was going to make that into caramel but don’t know if that will change the consistency of the cake? Theoretically it shouldn’t if you make it into the caramel correctly – or you can sue something like dulce de leche? Can you use regular salted peanuts ? For the peanut part? I don’t see why not! Do you ever add gelatine to your cheesecakes? I made your marsbar one a while ago and the chocolate orange one and even after leaving in the fridge over night they were both really soft (they were still eaten of course and were amazing!) but just wondered how I could make sure they set better. Thanks! If they were really soft, you didn’t whip it up thick enough. As you can see from my photos, I work well with the recipe and with no gelatine as I don’t like using it. You can indeed use it for a more guaranteed set, but obviously its not vegetarian. I’ll try that this time then as I’d rather not use gelatine either. Love your recipes they’re always amazing! Thanks ?? 3 words- I love it! I can’t get enough of this cake. 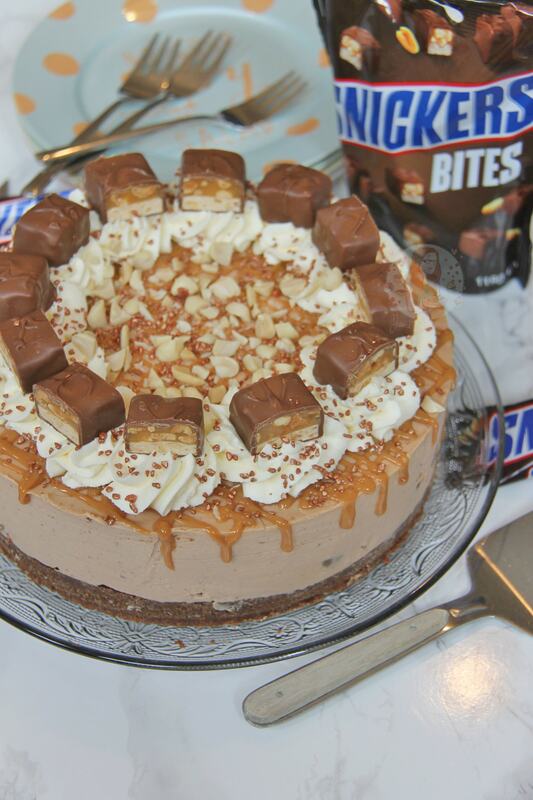 First its a cheesecake, then adding upon is caramel and then one of the favorite chocolate bar -Snickers. Its everything so sweet. My son is going to love this cake very much. I am going to make this cake at home for sure. It looks so delicious.